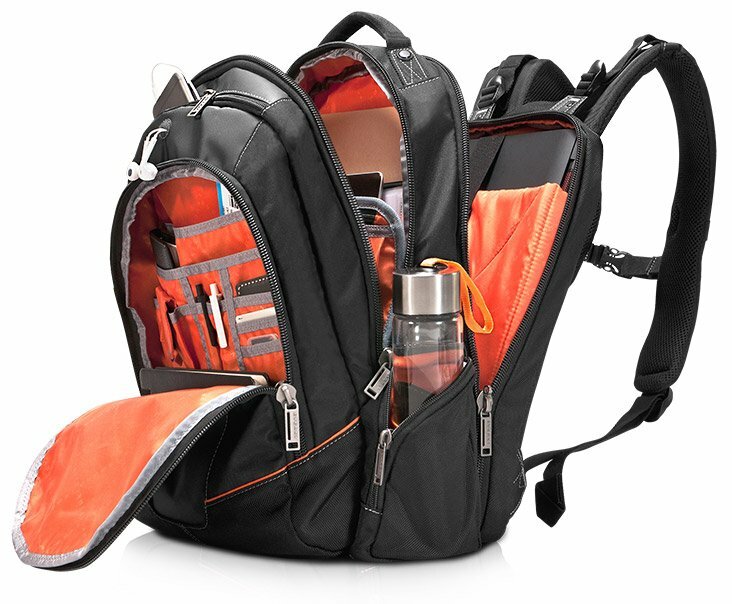 With three separate compartments for organization, this backpack can hold everything you need, right where you need it. Its durable materials, Checkpoint Friendly design and space for up to a 16-inch laptop make the Flight Laptop Backpack a nice perk for the frequent flyer. 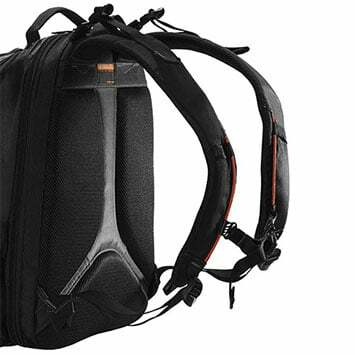 The Flight Laptop Backpack has all the features a frequent flyer demands, and it’s built with ergonomics in mind. The 5-point balance strap system, cushioned back panel and wide shoulder straps make it comfortable, even when it’s fully loaded. And you know it’s the details that make or break a bag, so you’ll appreciate the top pocket for your phone with a cable outlet, the easy access side pockets, and the “see everything” interior pockets made with mesh that lets you see what’s stored inside. There are multi-function mini straps to quickly slip your sunglasses into, and even taller water bottles won’t slide out of the side pocket when held in place with the water bottle loop. With the Flight Backpack, you’re prepared for any journey. Airport security can be a hassle, so we designed the Flight with our hassle-free 180 degree fold-out laptop compartment that allows you to breeze through airport security without removing your device from the bag. Simply open the Flight up 180 degrees, lay it flat, and your bag will quickly pass through the scanner. Should you need to remove your laptop, you can take it out and replace it without rummaging through your backpack or removing other contents. With a dedicated slot designed to hold your iPad or Kindle, you’ll never leave your tablet vulnerable to the ravages of an ill-fitting compartment again. 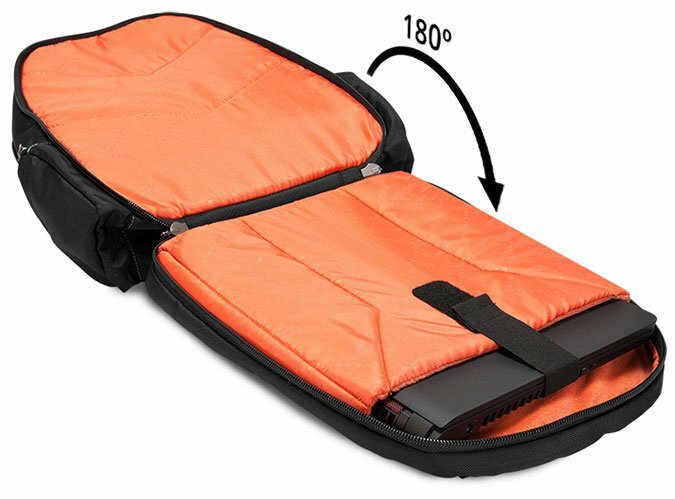 The dedicated pocket in the Flight Backpack keeps your tablet from getting rubbed or dinged by the other items in your bag; and it’s lined with the same super-soft felt that’s found in the laptop pocket. 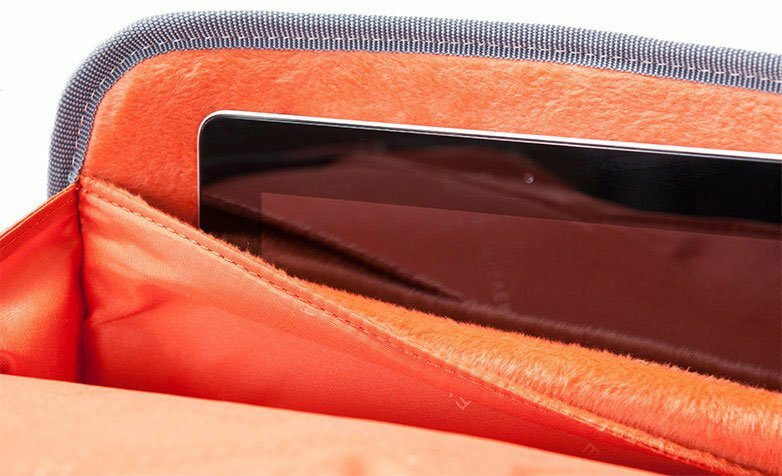 Once your iPad or Kindle is tucked away in the inner pocket, you can rest assured that it will be just as well protected as your computer. When your backpack is fully loaded it can get heavy, so we engineered a 5-point balance strap system to ergonomically distribute the weight and reduce muscle strain. The pillow-soft straps that adjust at the shoulders, two quick-slide straps at the bottom and one across the chest give you total control. The weight distributing chest strap also relieves some of the weight from your shoulders and brings it forward, giving greater balance. 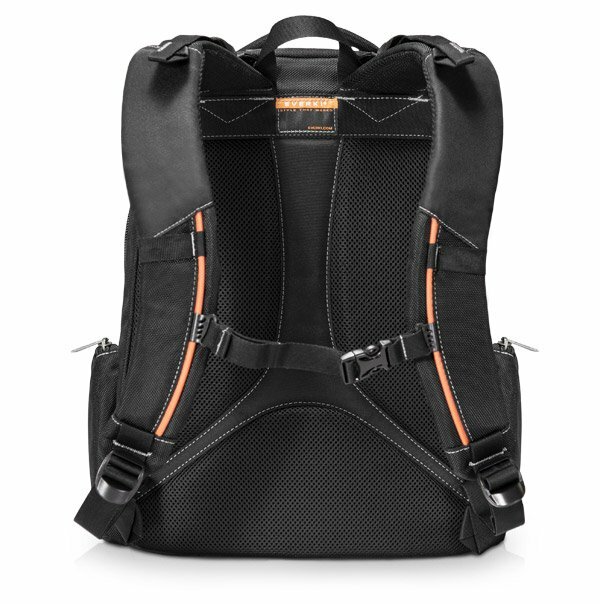 The Flight Backpack’s ergonomically designed carry system provides balanced comfort, even when your backpack is full. The Flight Laptop Backpack incorporates a contoured shoulder strap to strategically balance the load and reduce muscle strain. You’ll also find a padded back panel, mesh padding and deep airflow channels to provide maximum air circulation for breathability. 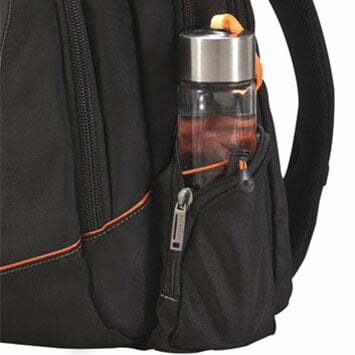 The two side pockets on the Flight Backpack allow you to safely secure your water bottle with the elastic loop, or stash accessories such as chargers and adapters. Plus, they’re fully zippered for a sleek and sophisticated profile. Have you ever broken a zipper on your favorite bag? We have. 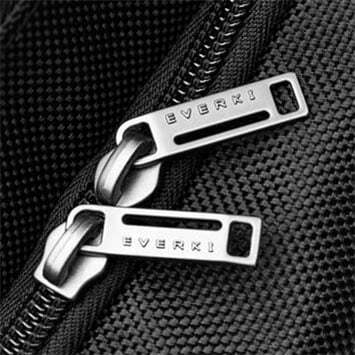 That’s why we designed the Flight using heavy duty zippers with extra large metal pulls. So your favorite bag can remain your favorite bag. The Flight Checkpoint Friendly 16" Laptop Backpack by Everki is a great product holding up to my daily abuse. Purchased on November 10th, 2015 because I am starting a limited-residency Masters of Fine Arts program and needed a carry-on that could carry everything I need to travel; my clothing and school supplies. It's also great as a daily backpack for the classes. This backpack holds an enormous amount of items. At this time, I use it for daily, I get into it many times a day. The zippers are superb and hold up well. They are sturdy and brilliantly designed with a way to lock the laptop compartment. On a daily basis it holds my 15.5" HP Laptop; four novels and notebooks ; a 10.1 inch tablet; an Amazon Fire 7" tablet; all my electronic power cords in a separately purchased organizer pack; an external hard drive and a power brick; thirty-fifty pens and pencils in a case; a wireless mouse; several thumb drives and SD cards; a toiletry 3-1-1 kit; a water bottle; my iPod with the earbud port that works well; a medium packing cube and a small packing folder (this fits between the laptop and the back of the main compartment of the backpack). 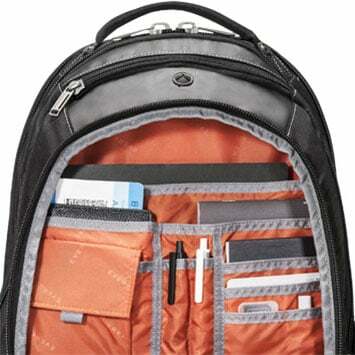 When traveling I can unzip the laptop compartment of the backpack for security and leave the packing folder on exposed part of the backpack. I could get all of this in the backpack and still lift it and carry it for a few hours, made me very happy. As I am an older woman, in pretty good shape. I was excited by this purchase. I researched these and other bags for almost three months before purchasing one. 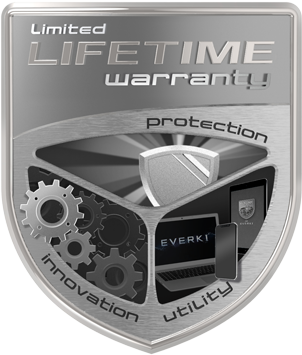 I looked at all the Everki Titan, and Everki Gaming backpack, the Swiss Gear ScanSmart 1900 (a bag that my daughter swears by), eBags TLS workstation, and the High Sierra Access bag; I settled on this one, because of the easy-peasy way through security I settled on this one and the lifetime guarantee. I have also measured the bag fully loaded in the carry-on dimension racks at the airport and it fits beautifully and will fit under the seat, in front of me on the planes while traveling. Great Bag and Excellent Customer Service: After 2.5 years of continuous use, I experience some fraying on the right shoulder strap of my Flight backpack. I submitted a warranty claim with photos and received an immediate response that the backpack would be replaced under warranty and sent to me by FedEx. very comfortable bag. keep the laptop safe from impact and cold. there is a lot of room inside and it keep the documents straight. QHow does this work ? AIt work good with your laptop.